When Moffitt Park Speedway was first created it was in response to the loss of the Bailey Avenue horse track, in Plattsburgh, which had been the site of local horse racing for years. As Jeff Myers points out in a great article he wrote about the venue in the Plattsburgh Press – Republican, the area had gone without a place to race horses from the 1920’s into the 1940’s. Any time people at Airborne Speedway mentioned the track to me, it was always in the light of being the forerunner to Airborne. Which was it - a horse haven or a car track ? The parcel of land, near US Route 9 and the road out to Cumberland Head had been owned by farmer Benjamin Hagar. The track had been sparsely used for horses in the late 1940’s, but the death of a stable hand in a late – night fire had dampened enthusiasm a bit for a while, causing involved parties at the site to look about to get in on the burgeoning motor racing sports that were spreading into northern New York. They were aware that racing was being held at the Champlain Speedway, in Ticonderoga; the old fairgrounds at Warrensburgh; and a small track near Bolton’s Landing. These were all running a mixture of roadsters, open wheel cars, and stock cars. What was a body to think if this was all they had seen of Moffitt Park ? What was bicycle racing – bikes or motorcycles ? From this point until around 1953, the site would see the horses and the motorized racers sharing the same turf. Never did the two perform on the same program, but it is clear that the track was being used for motor racing while horses were stabled and cared for on the grounds. Horse enthusiasts like Oscar Chellis and Ken Beaucaire had been working with others at the site to stage assorted horse activities, but these were not apparently enough to keep the enterprise afloat. Therefore, with the help of promoters Herb Pfeufer and sometimes – partner Jim “Red” O’Connor – auto racing would be offered at various times. Pfeufer seemed to primarily a motorcycle promoter; and O’Connor would be involved in promotion and / or publicity for Moffitt Park and Airborne Speedways, as well as some auto racing at the Richelieu Park horse track in Montreal. From what I can determine, Pfeufer was hooked up with the Adirondack Riders Motorcycle Club, which was primarily into the racing of motorcycles. Therefore, when Moffitt Park first looked for motorized competition on its track, the first shows were motorcycles. Soon thereafter, some open wheel racing cars would appear. Some of the local riders who first appeared at Moffitt Park included “Big Bill” Agadier, who had run a small hot dog restaurant mere yards away from the track and Joe Reid. Paul Clukey, George Day, Bobby Fisher. Tommy and Paul McDermott, Leon Shaw. Harry Mullins, Sam Hoopes, and George Gebo were other New York riders. Some of these riders – particularly Shaw - who came from the roadster racing town of Corinth, hauled up to Plattsburgh from further south in New York. Later, Whitey Anderson; Rick Fisher, Bob Woodward, and Bill Kiss would add to the motorcycle rosters. Big Bill Agadier, second from right, seemed a little large to race motorcycles. But, who's gonna tell him he can't ? The New Yorkers would be often joined by Canadians, who were usually billed by O’Connor as invading superstars. Jimmy Maille and Bobby Benn joined the headliner, George Day, riding for the Canadian contingent. Sometimes, in the local papers, riders’ first names would change from one week to the next, as either errors were made or – as often was the case – a brother might ride. Moffitt Park actually was quite the venue for late forties motorcycle competition, attracting teams from Canada, New York, Vermont, Massachusetts, and Maine. Eki Hakala, a Finnish rider from Sommerville, MA. And Doc Savage, of Springfield, MA appeared at Moffitt Park, as did Bert Wilde, of Shelburne, VT and Lloyd Berry, from Maine. Coverage of races would become confusing when an Illinois rider named Jackie Peterson came in and starred in a number of races, while South Burlington, Vermont’s Jackie Peterson was driving well in the sprint cars. The New York – based Fisher brothers, Rick and Bobby, and the Canadian Day brothers, George and Bobby, fueled a considerable rivalry between the Americans and Canadians. Eventually, the highest speed marks were going, back and forth, between Bobby Fisher and George Day. While the list track officials during the motorcycle racing era varied, from week to week, at least some of those running the show included Pfeufer; O’Connor [handling publicity]; John Sibley, track steward; Sam Pavone, track secretary; and judges and timekeepers for the races - Clifford Fleming, Leonard Parsons and Bud Ostrander. Occasionally Bill Aganier was listed as a promoter. Red O’Connor, at Airborne Speedway. Not long after the motorcycle programs were underway, in 1948 , automobile racing began. Apparently all racing began late in the 1948 season – in September. After one week of cycles only, cars came in the next week. In that first short season, Eddie Cox and Cliff Wright, from Carthage joined the Bouquet Valley contingent of Phil Soper, Sr. and Jr. and Charlie Sharrow. South Burlington, Vermont’s Jackie Peterson, Plattsburgh’s Art Prairie, Elmer Cross of Essex; Harry Murphy of Carthage; Bud Johnson of Lewis; Art Spoar of Albany all drove in the bigger sprint – type cars. Midgets were competed by Al Mosher, Otis Peck, Cliff Wright, Walt Cross, Frank Wilbur, and Harry Bridges – who held the distinction of being the first auto – mounted driver to be thrown from his ride at the track. fairly common open wheel car at that time. The auto contingent was impressive, if not very large. Cliff Wright would go on to be a stock car owner of considerable prominence; Leon Shaw would race stock cars; Walt Cross and Spoar would field stock cars for stars such as Pete Corey and Jerry Townley; and Peterson would become a Vermont State Champion. As the 1949 season came in, Bud Sawyer, and Bill Neville would be other drivers joining the programs at Moffitt Park. Like most other tracks of that time, Moffitt Park Speedway would try to entice more fans into attendance, first, by claiming that the latest measures taken were going to ensure no dust. That seldom happened. The second way most of the tracks tried to pull in a few more paying customers was with gimmickry, not entirely different from today’s minor league baseball parks. Moffitt Park was advertising various men would defy death by riding through a “wall of flame” on a motorcycle. The track’s reigning hot shot, Eddie Cox, did this once and the track has advertised that Canadian dare devil Roger Trombley was coming to perform the stunt, as well. pushed the envelope at whatever he was doing near a race track. …“Roger Trombley, daredevil and flaming wall crasher, failed to make appearance for his flaming wall Plattsburgh found itself on its own. In order not to disappoint the crowd for a promised event, Art Prairie donned the necessary paraphernalia and cracked through the flaming barrier unharmed. Another attraction featured an auto-motorcycle race between Prairie and Aganier with Prairie easily triumphing.”..
Jackie Peterson [last] and another sprint car driver chase Art Prairie around a rustic track at Sheldon, VT in the late 1940’s. The Sheldon races were running in the same time period as the first Moffitt Park shows. This was apparently typical of the Plattsburgh – based Prairie, who went on to be a risk – taking flag man for both the Airborne and Saranac Lake Speedways. Jackie Peterson considered the kamikaze – like Prairie to be his stiffest competition in his years with the sprint cars, and relates a story of Art taking down a hundred feet of fence at Montreal Richelieu Park [after which the facility was no longer interested in hosting Herb Pfeufer’s car races]. That assessment, coming from a man [Peterson]who broke almost everything in his body more than once, gives one some idea of Prairie must have been. Once he was flagging, Prairie did take great delight in seeing how close onrushing fields of cars could come to him without hitting him. 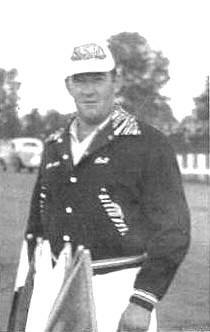 Lew Irwin is one of the teams which competed at the St. Lawrence Valley Speedway in Canton, NY. Teams like this used their experience as an advantage in the early stock car days around Plattsburgh at Moffitt Park and Airborne Park Speedways. The exposure the open wheel cars had gotten themselves running at Moffitt Park got them some shows in Canada, Vermont, and New Hampshire, but the handwriting was on the wall. Moffitt Park, it seems, did not do much with cars in 1950 through 1952, when the sport was going wild in Vermont and other northern venues. In 1953, the track re – opened as Border Speedway, and ran stock cars primarily from Vermont and from the St. Lawrence Valley Speedway in Canton, NY. Vermont had been in a growth spurt of stock car racing, having five tracks in Colchester, alone, as well as ovals in Sheldon, South Burlington, Newport and more. There was beginning to develop a small core of Plattsburgh area stock car teams, as well, led by Rusty Reed, of Plattsburgh and Howard Turnage of Cadyville. Rusty Reed was already a veteran of racing at Moffitt Park before many of his local rivals ever took to a track at Airborne Park Speedway. Here, he poses with George Palmetier’s 6 and 7/8 car, an entry driven by several local stars. The racing teams that had been running over in Chittenden County, Vermont – particularly at the Malletts Bay Raceway and the Colchester Raceway, had a distinct advantage, as they were closer to Moffitt Park than the Canton teams, and they had more experience than all but a few of the Plattsburgh teams. However, the earliest shows were won by Canton drivers like Doug Raucher, with Massena’s Allen Shirley and a Gouverneur driver named Clement placing high. Although the Border Speedway organization attempted to move their shows into 1954, the bigger and flashier Airborne Park Speedway had opened on the other side of Plattsburgh; and the Moffitt Park oval was summarily put out of business. In the short life span of the car racing at the oval, the site had seen harness racing, sprint car racing, midget car racing, motorcycle racing, a rebirth of the Clinton County Fair, and probably a few minor carnivals and bazaars. The old site had seen its share of good times and both good and tragic stories in its short run. The above auto race ad is from the open wheel era at Moffitt Park. Anything Border Speedway, such as the ad below, is all stock cars. Moffitt Park nuts like me were very excited to see this 1964 aerial view. The interstate was still relatively new, and what is likely the second and fourth turns are visible among the various ramps near the Cumberland Head exchange. Nothing is seen today. The site of bucolic stables, quiet harness races, Bill Agadier and his hot dog restaurant, crazy Art Prairie, visiting thrill shows, early stock cars coming in from Vermont on the Lake Champlain ferry, and lots of fun for a less than a buck are gone now, under the Northway and the Channel 5 parking lots. A sparse few people like Jackie Peterson and Norty Foster are still around to tell people like me all about it. If it wasn’t for that rustic little horse facility, the mighty Airborne Speedway might well have never been conceived of. one of Frank Hart's sons.